Posted on June 28, 2018 at 9:10 am. I returned to full time employment just over 4 years ago after being unwell with severe depression. I have been very fortunate to receive vital support from my Employment Support Officer over the past 4 years. Illness can leave its mark on a person and rock their confidence. I have found the support, advice and reassurance I have received through this programme invaluable. I could never have coped or managed to progress my role without this help. Since returning to work I have had some very difficult times personally, at the start bereavement and then more recently my husband being ill, the valuable support I received especially at these times helped me continue working despite the challenges. Being able to meet someone outside work, an encouraging email, text or telephone call made all the difference. 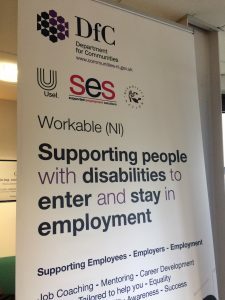 I would personally like to thank my Employment Support Officer, the Workable Programme for all the help I have received and would highly recommend to anyone.